I have traced references to this to 2004, but it may be older than that. According to the wiki spoof site Encylopedia Dramatica it originated as “Im in ur base killin ur d00ds”. 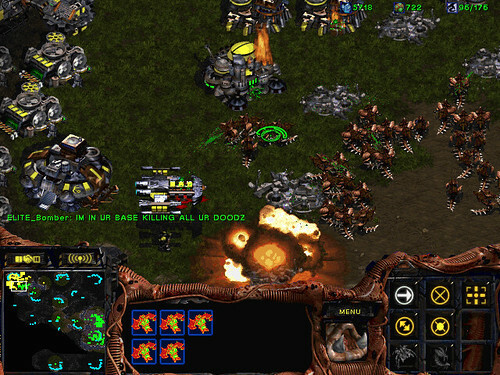 Sources around the web believe that the phrase appeared on a StarCraft screenshot in the Something Awful forums, but if it did, it can no longer be found there or anywhere else on the web. 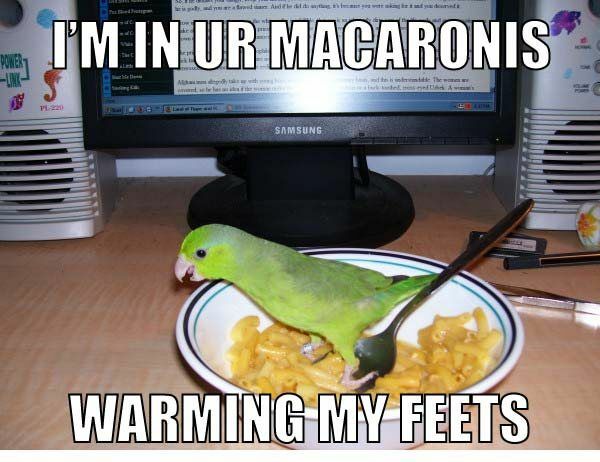 a (possibly non-original) version of which SomethingAwful member Lucas Ng dug up for me. Ask the average internet user and they’ll probably be able to produce a variation on this snowclone and give a sense of where it comes from: gaming chatter, leetspeak, etc. This is, I think, what makes this phrase a snowclone–it is meant to be funny, but it isn’t funny if you don’t know anything about the world in which it originated. Since the content words are all variables, the meaning of this phrase isn’t necessarily limited to “LOL you got pwned and don’t even know it yet”. That is, if you write, “Im in ur meeting planning ur barcamp”, you’re not saying that you’ve taken over the meeting. You’re making a literal statement about where you are or are going to be and how geeky you are. This entry was posted in Snowclones and tagged lolcats. Bookmark the permalink. I have no idea if this image is genuine or not but the premise of the screenshot is definitely the closest I have found to the origin. Here’s the full story as I remember it. A terran (human-based race) is dueling a zerg (alien-insectoid-like race) in a 1v1 game on the map (a battleground), made for up-to-8 players (i.e. it’s very large, with 6 more spots where a player could potentially start off). The terran spends the entire game building up a fleet of battlecruisers (slow, ponderous but powerful spaceships). Mr terran then goes hunting for the zerg – remember how slow these battlecruisers are? As you can see in the screenshot, the brown zerg units have the yellow terran base up in flames. I just want to let you know that your own variation (“I am in your forum posting in a grammatically accurate manner”) is officially made of pure win. @JD Kolassa: I wish I could take credit for that one, but alas, it was not me.